May | 2011 | Another Beautiful Day in Paradise! 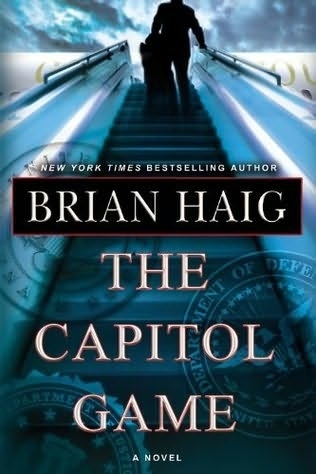 I just finished a pretty good book, The Capitol Game, which is the latest from thriller author Brian Haig. The summary from the fly-leaf describes the plot as well as I can. In The Capitol Game, Haig breaks away from the Sean Drummond formula and creates an entirely different set of characters and a story type. This book reads an awfully lot like a Grisham novel. The somewhat mysterious main character is obviously working some kind of scheme, but the reader isn’t quite certain what it is. The protagonist, Jack Wiley, is a charismatic, young investment banker, but Haig only reveals his actions, not his inner thoughts. Not until the last few pages does the plot come to light and the motivation become known. All told, The Capitol Game was a fun book and I recommend it. If you enjoy Grisham and DeMille, you should enjoy this and the rest of Haig’s books. Mrs. Poolman and I decided we need to start getting out a little more frequently. We tend to be home-bodies. We hardly ever go to shows or even movies. Our dining-out usually means hitting one of the informal and inexpensive restaurants in our general neighborhood. We broke from that pattern on Saturday. We went out for a casual dinner with some friends and then attended the student production of “Hair,” presented by the Savannah College of Art and Design. We had a great time. What the cast (or “tribe”) lacked in professional-level skills, they more than made up for in enthusiasm. We were front and center in the second row, which was well into the “audience participation” zone. The whole experience was a bit of a flashback. 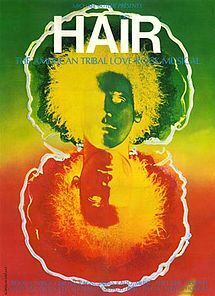 When Hair first came on the national scene, I was a junior and senior in high school. We had the album and I think my brother and I pretty-much wore it out by playing it so many times. It was a good time. The other news around Casa Poolman is that Poolboy bought a boat, which is currently sitting in our back yard. A friend of his was moving out of town and didn’t want to take it with him, so Poolboy got quite a bargain. It is a small McKeecraft. Around here, it would be called a “creek boat.” That means it isn’t big enough to go off shore, or even into some of the larger sounds if there is any kind of wind and chop. Since it is stored in our backyard, Mrs. P and I will also have use of it. I have some experience with boats and have even taken the Coast Guard safe boating course. 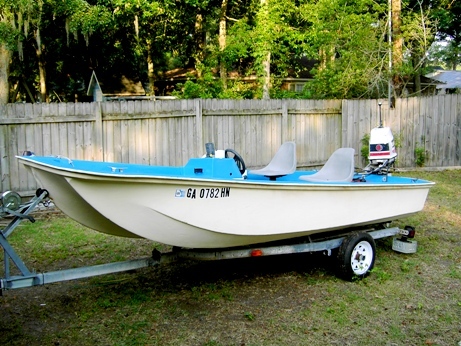 But most of my experience is with the kinds of boats that have centerboards or keels, sails and no “reverse.” I told Mrs. P that I didn’t want to take it out until I had a chance to be “checked out” by someone who knows what they are doing. (And we have plenty of them around.) For some reason Mrs. P thinks that is funny. The other issue is more practical. At the moment, no one in our family owns a car or truck with a tow-rig or, most likely, enough power to pull the trailer. I’m not quite sure how that is going to be resolved. We’ll see. Two videos in one week. Wow! I ran across this video by Savannah College of Art and Design film major Nicholas Reichard. It’s a very cool time-lapse collection of Savannah scenes. This is a very pretty city, and the videographer did a great job! It was another quiet weekend around Casa Poolman. Saturday was a little rainy, which quashed our plans to do yard work. We ran a few errands and puttered around the house. We planned a “double feature” of DVD watching in the afternoon and evening. However, our friend, Susan, called saying she was bored and was looking for playmates. We invited her to join us for dinner. So we spent the evening “visiting” rather than watching movies. We had a few friends over for an “open pool” on Sunday afternoon. The weather cooled down a little and so did the pool water, so there was not a lot of splashing around — more sitting around the deck drinking beer. 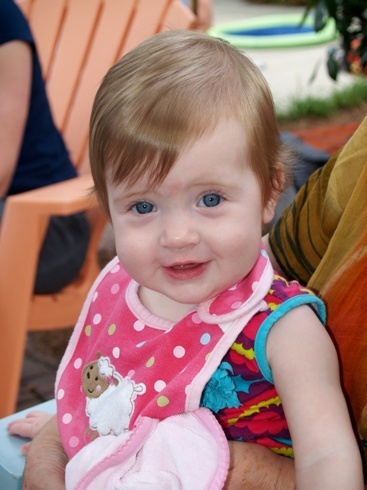 Our friends Steven and Liz dropped by with their two nine-month old twin daughters. The girls were great. 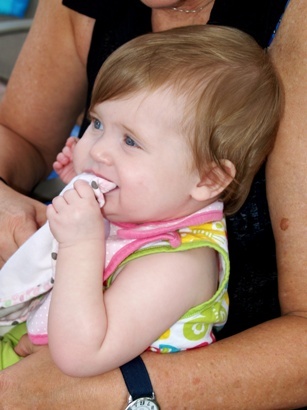 They were very happy to sit with and socialize with whoever was holding them at the time. Too cute! This had been around for a few months, but I just saw it. If you haven’t seen these baby ducks fighting the wind, you have to watch it! 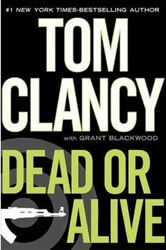 I just finished Tom Clancy’s latest book, Dead or Alive. I have always been a Tom Clancy fan, but I have to confess, I was not impressed with this latest effort, which was co-authored by Grant Blackwood. Maybe that was the problem. I have been a big Clancy fan ever since he came out with his first big one, The Hunt for Red October. I have read all his fiction thrillers, and most of his non-fiction. I love his stuff. Maybe that’s why I was disappointed at his latest effort. 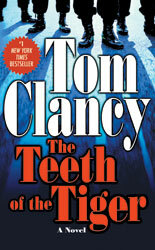 Clancy returns to the plot line and characters of his earlier book Teeth of the Tiger. As a matter of fact, I re-read Teeth before starting Dead or Alive, just to bring myself up to speed. The second book simply picks up right where Teeth left off. The main characters, Brian and Dominic Caruso and Jack Ryan Jr. are back, working for the secretive terrorist-hunting organization known as “The Campus.” They are joined by old friends, John Clark and Ding Chavez. This time the bad guys are working a complex scheme to launch a series of attacks on the US, and it’s up to the guys at “The Campus” to stop them. Clancy likes to weave together different story lines — seemingly unrelated, but we all know better. (After all, if they weren’t related, they wouldn’t be in the book.) Then they come together to create the plot. However, the biggest problem with the book is that there are so many plotlines that develop so slowly, it is difficult for the reader to keep track of them all. At least a couple of plotlines never do develop and apparently were inserted just to introduce characters or set the scene for the next book in the series. In one, an Army ranger, is accused of murder for what he did on the battlefield. This premise could be the basis of an entire novel in itself. Instead, the legal issue is dropped and the character is assumed into The Campus team. There were a lot of pages of narrative, just to introduce a new and not advance the main plot of the novel. In another, Jack Ryan Sr. decides to run for president once again. This also just sets the scene for the next book because after he makes his decision to run, the authors drop the plot line. Ryan is last seen working on his autobiography. For a true Clancy fan, it’s a good, but lengthy effort. 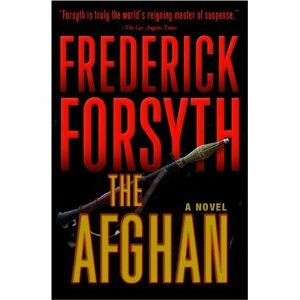 However, if you would like to read a book with a similar plot, but tighter plot development and more compelling characters, try “The Afghan” by Fredrick Forsyth. It is simply outstanding. I scored one small victory last night. It comes on the heels of one of my biggest disappointments while on my current job. Part of my job is to open lines of communication between the science we do and the general public. In the past, we have held public lecture series. The last series which we sponsored last fall was pretty much a dismal failure. For a variety of reasons, our attendance was miserable. Feeling a little burned, some of the people here, including myself, have been reluctant to get back on the horse and try again. I decided to take a different tack. Rather than sponsoring a publicly advertised lecture series, we went with a smaller, more exclusive event. We targeted the roughly 240 families that are members of our foundation. We billed it as a special, “by invitation only” event, and sent out printed invitations to the membership. We asked for RSVP’s because “space is limited.” We also encouraged our members to bring their friends as “their guests.” We included a wine/beer/snacks reception. Our program focused less on science, and more on adventure. The speaker, one of our scientists, has been doing a lot of work in the Arctic Ocean at Barrow, Alaska. Everyone was happy. Yea! We’ll try another one in the fall and hope for similar or even better results.